– Chevy’s: Cinco de Mayo specials all weekend long with drink specials, games and activities for the kids. – Burgerville: buy one regular size fresh strawberry milkshake or smoothie and get one free, valid only after 8:00pm – close from now until Monday, May 7th. 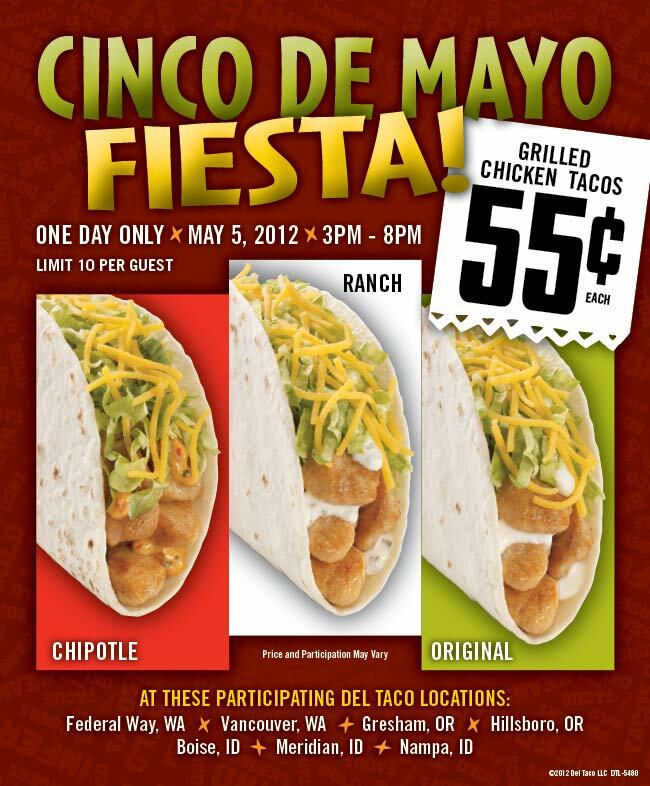 – Del Taco: grilled chicken tacos are just 55 cents on Saturday from 3:00pm – 8:00pm. Choose from original, ranch and chipotle, limit 10 per customer. – Red Robin: Red’s Tavern Double with bottomless steak fries, just $6.99 for a limited time. Upgrade the burger with additional toppings for just $1 more. – Quiznos: free chip or dessert and a regular fountain drink with the purchase of a regular or large salad or regular or large salad, with coupon. Expires on Wednesday, May 9th. – Sonic Drive-In: half-price real ice cream shakes, valid only after 8:00pm until close, all summer long! – “Future of Food” film screening, Thursday 4:00pm at First Unitarian Church in downtown Portland, free. – “Willamette Valley’s Funniest Person” Finals, Thursday 8:30pm show at McMenamins Bagdad Theater, just $5 admission (21 and over only). – Target First Friday free admission to the Children’s Museum, 4:00pm – 8:00pm. – Cort & Fatboy “Late Night Movies” presents the 7th Annual Big Lebowski Event, Friday night at McMenamins Bagdad Theater. $3 day of show general admission for the 11:00pm screening. – Final days of the Hillsboro Public Library Used Book Sale, now through Sunday! – Portland Community College’s Theatre Arts Program presents the play “Everyman” by Anonymous, 7:30pm Friday and Saturday at PCC Sylvania campus. Tickets are $10 general admission at the door. – Wood Demon Art Theatre presents “Waiting for Godot,” 8:00pm performances on Friday and Sunday. $5 suggested donation. – 28th Annual Cinco de Mayo Fiesta, Friday – Sunday at Portland’s Waterfront Park. Admission is free only on Friday from 11:00am – 3:00pm, otherwise it’s $8 for adults and $5 for kids/seniors admission charge. – ISing Community Choir performs their spring concert on Friday, Saturday and Sunday at Beaverton’s Bethel Congregational United Church of Christ. From web site: “The ISing Community Choir, ISing Children’s Choir and The Circus Project will join together to present Carl Orff’s Carmina Burana. Enjoy circus performers, acrobatics, aerialists, dancers and more all set to the powerful music of Carmina Burana.” Admission is by donation. – Gathering of the Guilds, Friday – Sunday at the Oregon Convention Center. See artisan hand crafted work in clay, glass, metal, wood, fabric and beads. Free admission, over 150 booths, live demonstrations, music, activities for kids and much more. – 11th annual NW Pet and Companion Fair, Saturday and Sunday 10:00am – 6:00pm at the Portland Expo Center. Admission is $8 for adults, $6 for seniors and $4 for kids. Click here for a $2 off coupon. – Free Comic Book Day, Saturday at local comic book shops in the area including Excalibur Books and Comics, Future Dreams, Floating World Comics, Things From Another World and Bridge City Comics. Please see web site for more listings. – Write Around Portland free writing workshops on Saturday, 10:00am – 12:00pm at locations around the Portland area. This event is free, but registration is required and everyone is welcome to participate. Journals, pens and light snacks provided. – Portland REI Used Gear Sale, Saturday beginning at 8:00am sharp at the Pearl district location. Two weeks ago we listed the Tualatin sale on a Sunday and it was wrong — this event on Saturday is the right date and time, so come on out for some great bargains just in time for the upcoming summer! – Tualatin River native plant sale, Saturday 9:00am at Tualatin River National Wildlife Refuge, free admission. – Portland Sacred Harp 6th Annual All Day Singing event, Saturday 9:30am – 3:00pm at the Little Church, admission is free and donations are graciously accepted. – Incredible Edibles Plant Sale 2012, Saturday 10:00am – 3:00pm on the grounds of All Saints School, 601 NE Cesar East Chavez Boulevard. Free admission, everyone welcome. – Kentucky Derby, watch it on the big screen with food and drink specials on Saturday at McMenamins Mission Theater, Portland Meadows, Blitz Bar Sports Pubs and EaT Oyster Bar. The Gypsy Restaurant and Lounge will also host the 2012 Weenie Dog Cup. Post time is 3:30pm for the horses, 2:00pm for the weenie dogs. – Oregon Chamber Players perform 7:30pm Saturday at All Saints’ Episcopal Church with a program to honor and celebrate their founder and artistic director, Timoteus Racz. Free-will donations will be accepted in lieu of general admission. These donations will be for the Oregon Chamber Players/Junior Symphony of Vancouver organization that he founded and funds will be used to ensure that his legacy will live on. – 2012 Springfest Health & Wellness Fair, Sunday 10:00am – 2:00pm near the north entrance to Hillsdale Farmers Market. – Portland REI Used Gear Sale – Clearance, Sunday 10:00am at the Pearl district location. REI Coop Members Only. Items not sold on Sat. 5/05 will be priced at 50% off. Items are one-of-a-kind; come early for best selection. All sales are final. – Portland Opera Preview “Candide,” Sunday 2:00pm at Multnomah County Central Library Collins Gallery space. Free. – Honoring Our Rivers Student Anthology Reading, Sunday 4:00pm at Powell’s City of Books on Burnside, free. – Still need more ideas of what to do this weekend? Then please take a look at Arounthesunblog and PDXPipeline for more! And if we missed any events that you’d like to mention, please leave a comment below. This entry was posted in Spotlights and tagged Bagdad Big Lebowski, Bank of America's Museums on Us, Cindo de Mayo Festival, free admission Children's Museum, Free Comic Book Day, Gathering of the Guilds Oregon Convention Center, Hillsboro Library used book sale, Hillsdale Springfest Health & Wellness Fair, ISing Community concert, Kentucky Derby Portland Meadows, NW Pet & Companion Fair, OMSI $2 admission, Portland First Friday art, Portland First Thursday, Portland Opera Preview, Portland REI Used Gear sale, Portland Sacred Harp singing event, Willamette Valley's Funniest Person. Bookmark the permalink. I can’t find the Del Taco deal mentioned anywhere other than here. Can you tell me where you heard about it?